Editor’s Note: This feature originally appeared in the November issue of MReport, out now . As the business environment becomes more competitive, organizations are looking at ways to change their workplace culture not only to remain relevant to a new generation of employees but also to employ a strategy that improves the productivity and profitability from their human capital. A recent article on understanding and developing an organization’s culture by the Society of Human Resource Management stressed having a culture based on a strongly held and widely shared set of beliefs that were supported by strategy and structure. It emphasized three aspects of a strong culture: 1) employees are aware of how top management would like them to respond to any situation; 2) they believe that the expected response is the right one; and, most importantly, 3) employees know they will be rewarded for demonstrating the organization’s values. Therefore, it becomes imperative for companies who want to be a great place to work to begin the process by hiring people who are the right fit for their culture. The book How Google Works discusses an important idea— the only way for businesses to consistently succeed is to attract the best ‘smart creatives’ (people who combine technology, business expertise, and creativity) and create an environment where they can thrive. But the question is, what can a company do to attract the kind of talent that adds to creating a great company culture? At Finicity, the hiring managers follow a two-step process. The first is using customized assessments and coding challenges, depending on the position, to determine certain skill sets prior to scheduling an interview, depending on the position and skill sets required for it. Once the company has a match of skill sets, the recruitment team sets up the interview. Being open about what the company is and what it isn’t is also helping organizations pick the right person suitable for the job. This includes communicating transparently throughout the hiring process, setting clear expectations from the candidates, and really listening to what they expect from the company, whether it is a big or a small organization. said Daniel Jacobs, EVP, National Retail Lending at MiMutual Mortgage, while explaining that communication that always ensured all parties involved knew what to expect next, when to expect it, and what was required of them was the “secret sauce” of the company’s hiring team. If the path to retaining great talent begins with the right hiring process, a robust employee engagement program serves to strengthen it. It ranges from such must-have benefits as competitive compensation, a 401(k) program, and medical insurance to perks like discounted event tickets and employee loan programs. At Carrington Mortgage Services, the former is a popular program that allows employees a shot at owning their dream home. The program includes waivers for processing and/or underwriting fees and a quarter-point discount on their mortgage rate once an employee qualifies for a Carrington home-loan program. Sharga said that Carrington also offers employees a diverse range of benefits, including access to legal services, comprehensive health and wellness services, discounts on entertainment and gym memberships, as well as savings on appliances and wireless services. Giver cultures also mean those where an individual’s professional development is given high priority, and that’s where some of the best companies in business differentiate themselves. Apart from its in-house Carrington University, which offers a wealth of classes to help employees learn essential skills and develop their personal and professional goals, Carrington also offers tuition reimbursement from accredited colleges or universities. Through this program, eligible regular full-time employees can be reimbursed up to $5,250 per year, and eligible regular part-time associates may be reimbursed up to $3,000 per year. Another example that Carrington’s Sharga gives is a program called LeaderSHIFT, a self-mastery program for high potential employees to develop leadership competencies and management skills. “The 2017-2018 LeaderSHIFT graduating class included 85 Associates from across Carrington,” Sharga said. The dress code at MCS might be casual, but the company takes career opportunities for its employees seriously and offers training to get new hires up to speed quickly and a very defined career path for those who are interested in moving up in the company. Companies are fast waking up to the power of recognition in retaining employees. 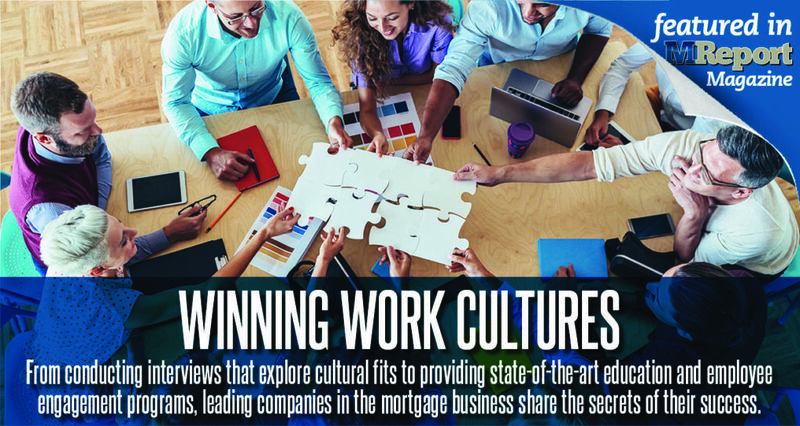 Whether it is a policy of promoting from within or having customers and vendors taking part in recognizing an employee’s efforts, organizations across the mortgage industry have some form of rewards and recognition program to celebrate their employees’ achievements. Carrington’s Best Catch program, for example, gives its broker, retail mortgage, and servicing customers the opportunity to recognize employees who provide exceptional service through online feedback to the Associates’ managers. off, in an industry where, according to Hutchins, late hours and intense commitment to projects is the norm. “Additionally, every year, Finicity recognizes its ‘Most Valuable Finitizens’ from within the company, and treats them to a group trip, with spouses and significant others,” he said. RCN Capital has embraced the concept of promotion from within. “Numerous employees at RCN have been promoted from within,” Tesch said, giving examples of Erica LaCentra, the company’s Director of Marketing, who started with RCN as an entry-level marketing associate, and Matt Ferrigno, Senior Loan Officer who began his career as an intern with the company. “RCN’s team goals are punctuated with monthly goal check-ins, recognizing company achievements, and milestones, as well as the hard work the employees are putting in along the way,” Tesch said. For many employees, volunteering for social initiatives or giving back to the community is also a rewarding experience, and organizations within the industry have been quick to include them in these initiatives. From helping veterans integrate with the mainstream and giving grants to various foundations to helping in neighborhood and community development, organizations are involving their workers so they can take pride in giving back to the community. Safeguard formed the Safeguard Cares Committee in 2011 to centralize and coordinate its fundraising efforts. Made up of employees from Safeguard’s two offices in Ohio and Texas, members are responsible for picking a charity and planning and promoting the fundraising efforts. “Safeguard places a big emphasis on promoting volunteerism in the company’s contractor network as well, supporting monthly volunteer efforts that help to maintain strong and vital neighborhoods, improve quality of life, and provide a safe environment for families to raise children,” said Jennifer Anspach, AVP of Human Capital, Safeguard Properties. Both Black Knight and Carrington have robust programs to help veterans integrate with the mainstream. While Black Knight has a special hiring process for veterans, Carrington has supported housing for veterans through its Carrington Charitable Foundation (CCF). “CCF’s Veteran-focused Signature Programs focus on providing mobility, stability, purpose, and prosperity for veterans returning from post-9/11 conflict battlefields,” Sharga said. Black Knight’s veterans-only career fair and its support for Operation New Uniform helps veterans make the transition to private-sector work. The transformation to become a great place to work, like any other change in a company, must begin at the top. The latest Pricewaterhouse Coopers (PwC) CEO survey revealed how important it was for CEOs across the globe to hire and retain top talent to compete in an increasingly digital world. “But they’re not just improving compensation packages, it’s crucial to create the right employee experience too,” the survey indicated, with 86 percent of the CEOs saying they were modernizing their working environment and 77 percent saying they were implementing flexible ways of working to recognize how today’s top talent wants to work. The same survey found that 67 percent of CEOs agreed they had a corporate responsibility to retain employees, especially those whose jobs were automated. Whether it is best hiring practices or fostering a culture of giving back, employee engagement begins with the top management. From something as simple as sharing the company’s vision via live video feed to all employees nationwide on a regular basis, to actively interacting with employees every month, leadership is driving employee retention from the top. At Black Knight, its mentor program matches mentors and mentees based on common interests and potential for knowledge transfer. “These relationships are cultivated through regular meetings, formal networking, and community service events,” Circelli said. Listening to employees is also an integral part of leadership engagement. According to Anspach, the company’s Connecting With Respect initiative was born from Safeguard’s employee-satisfaction surveys which showed that, although Safeguard has a solid corporate culture foundation, more could be done to support Safeguard’s corporate value of “Respecting our employees and contractors.” Today, the Respect Initiative class is mandatory for all employees.